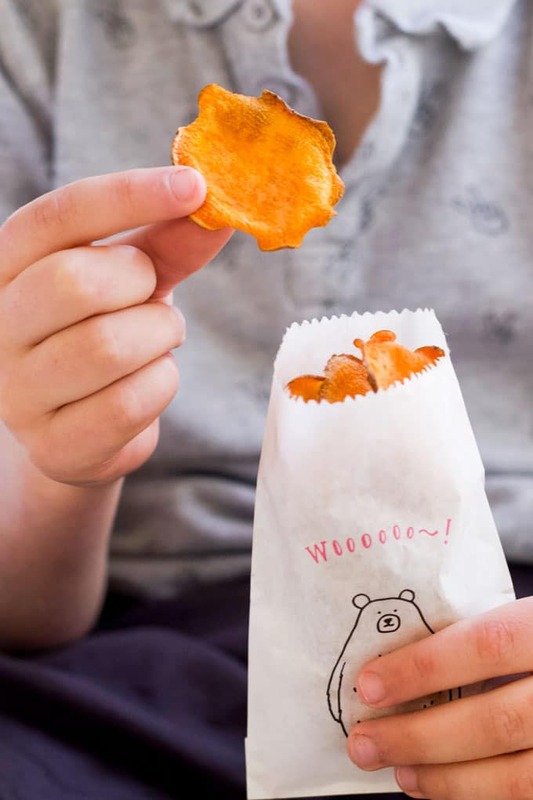 Crispy Sweet Potato Chips, perfect for snacking or popping in a lunchbox. 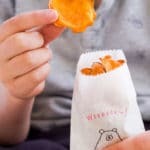 I first attempted baking Sweet Potato Chips several years ago. I followed a recipe and was expecting delicious and crisp chips, mirroring the ones that were illustrated in the book. Instead, I got a tray of burnt and bitter chips that nobody was willing to eat. Around six months later I decided to try again, using a different recipe, but this time half my chips were burnt to a crisp and the other half were soft and soggy. Fast forward another year or so and I failed again, but this time I was determined to nail the recipe. After, what seems like, several hundred sweet potatoes later, I finally have found a method that works for me. The outcome is dependant on many variables, not just the cooking time and temperature. I’ve decided to share my experimental results in the hope that you, too, can make perfect sweet potato chips. 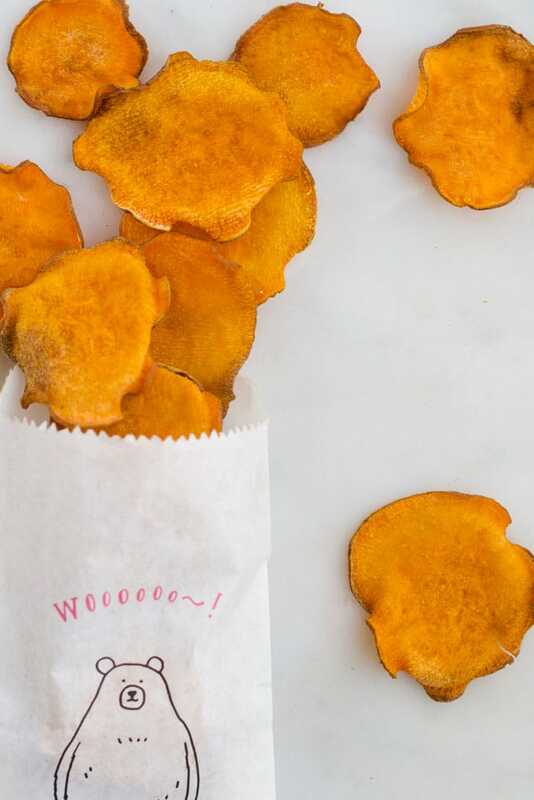 My first tip for making perfect Sweet Potato Chips is to take your time. I can’t emphasise this enough. If you give them love and attention you will reap the rewards! Each of these areas can change how your chips turn out. Some are more important than others but they can all affect the results. I recommend using a mandoline to slice your potatoes. They produce thin and uniform slices which is important for even cooking. You can slice with a knife but this will take a lot longer and they may vary in thickness. I use the thinnest slicing setting, producing slices that are 1.5-2mm thick. This is the thickness that I have found to produce the best results. If you slice thicker then the cooking time will vary and the results will differ. Soaking potatoes draws out the excess starch, which is desirable when making crispy products such as chips and fries. I soaked sliced potatoes for an hour and, keeping all other cooking variables the same, cooked and compared them against slices that hadn’t been soaked. Soaking produced marginally better results but I didn’t feel like it made a huge difference. If you have the time then I would soak your potatoes for around 30min-1 hour before cooking. I found this step made quite a big difference to the cooking results. 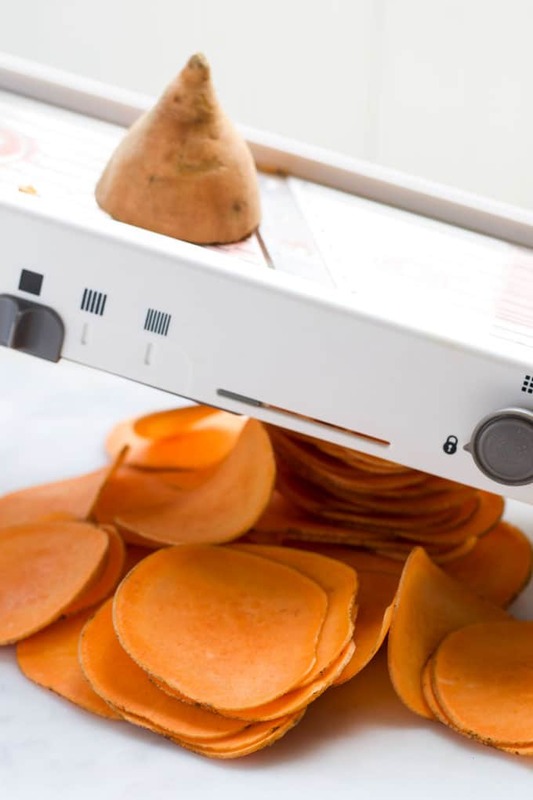 Pop your sweet potato slices on a clean dish towel and pat them dry. Previously, when attempting to make sweet potato chips, I added the slices to a large bowl along with some oil and then mixed with my hands. I think that doing this resulted in an uneven coating of oil which affected the cook. Better results are produced if you oil the chips individually. I used a pastry brush to do this or you could use a spray oil. I used avocado oil and compared the results with olive oil. Surprisingly the oils didn’t change the result too much, the avocado oil being marginally better. The baking tray lining choice was probably one of the areas I saw the greatest differentation in results. What you cook your chips on really can make a difference to the end texture. FOIL – Foil produced the best result and the chips were noticeably more crispy. Cook on the dull side. BARE TRAY – If you don’t like cooking with foil, then cooking straight on the tray produces the next best result. 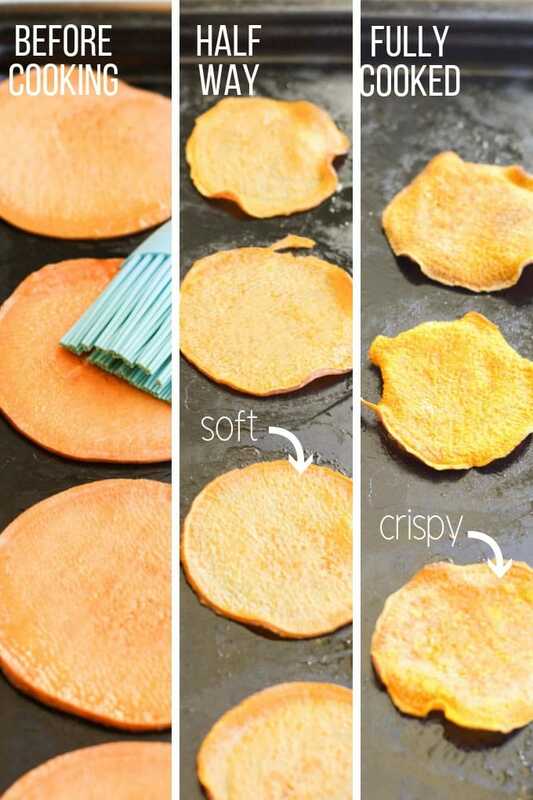 BAKING PAPER – I found more of the chips were softer when using baking paper. SILICON BAKING MAT – This produced the worst result, many of the chips were soft and chewy. Don’t be tempted to overcrowd your tray, lay your chips in a single layer. If there are too many chips on your tray more moisture will be produced and they won’t crisp up in the same way. Cooking the chips at a low temperature for a long time (100c for 2 hours). I found the chips had a slightly chalky texture cooking them this way and the mouthfeel just wasn’t right. I’m sure I could have experimented more with the low oven temperature but realistically I felt that I would rarely have 2 hours to spend making a couple of trays of chips. I only made one batch. This is my prefered method of cooking the chips and it is the method I used to test most of the variables. I found 170C / 340F (Fan assisted) worked best but this could vary depending on your oven. After the cooking time is finished you may think that some of your chips are still soft. Don’t worry yet! Let them sit in the tray for 5 mins. This helps them to harden. or pop them in the lunchbox. If you have any leftovers, (like that is ever going to happen), store them in an airtight container. Have you tried this recipe? I’d love to know what you think. Please rate and comment below or tag your photos on Instagram. Using a mandoline, (on the thinnest setting), slice your potatoes to produce uniform, thin rounds around 1.5-2mm thick. (Optional - SEE NOTE 3) Soak your potatoes in a bowl of water for 30min - 1 hour. Ensure your rounds are dry by placing them on a clean dish towel and patting them dry. Add a single layer of sweet potato rounds to the baking tray, being careful not to overlap. Brush, (or spray), both sides of each round with oil. Remove from oven and allow the chips to sit in the baking tray for a further 5 mins. This helps to crisp them up. If you have any soft chips after this, return to the oven for another couple minutes. I have tested this recipe with avocado oil and olive oil. Both worked well. What you line your baking tray with can really affect how crispy your chips will turn out. See post for more details. Foil works best followed by no liner. Soaking the potato draws out some of the starch which can result in crispier chips. I only noticed a marginal difference so if you don't have time you can miss this stage. Monitor in the last 5 mins of cooking to check that the chips are not burning. Nutritional Information is a rough estimate only, calculated using an online nutrition calculator. Where Arecibo you’re bags from please? I’m sure my little one would eat anything out of those! Your tips work, mine cooked up great. Works for beetroot too. Kids loved the sweet potato but weren’t as sure on the beet ones so I ate them all! Thanks Laz, glad the tips worked for you. It took me several failed attempts to master these!